At present, the martyr is seemingly defaced by the onslaught of commercialism. Valentine’s Day today is associated with flowers, particularly roses, and a box of chocolates. 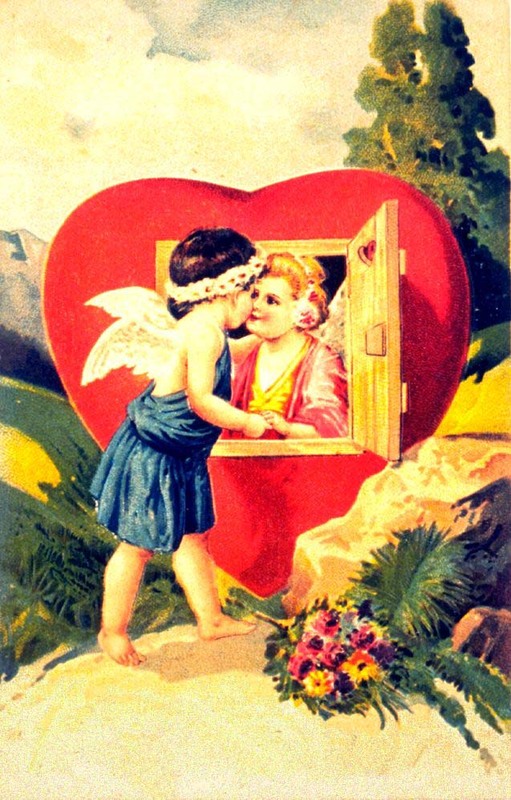 Another feature of this day is the exchange of greeting cards showing Cupid shooting arrows on red hearts. Whoever came up with the idea, either has a stake in horticulture or a distant relative of Willy Wonka, Milton Hershey or Hallmark. Or of Greek or Roman descendants. Cupid, son of Venus, is the Roman name of Eros, god of love, sprung from Chaos or the son of Ares and Aphrodite. But what the hell is Cupid doing in this? Now we are seeing cherubims and angels shooting the same potion-laced darts or arrows to unsuspecting persons. Legend has it that Cupid has a starring role on Valentine’s because of his deep love for Psyche, a mortal maiden whose beauty was envied by Venus. For more on Cupid’s story, see this site. The cherubims and angels might be a Christian believer’s attempt to honor the traditional Valentine’s day, a commemoration of the martyr of Rome. The rose represented beauty and love in the Greco-Roman culture. Sir Leigh Teabing says it symbolizes the five stations of female life  birth, menstruation, motherhood, menopause, and death. The redness of the rose, although there are other color varities, have been adopted as the color of this day. Red is the color of life, i.e., human blood. Although most people believe that the brain is grey, probably because of our association with ‘grey matter’, a living brain is most likely colored red because blood feeds the living cells in it. Chocolate is made from roasted and ground cacao [Theobroma cacao] seeds. Before 2000, the top five producers of cacao are Ivory Coast, Ghana, Indonesia, Mexico and Ethiopia. In itself, cocoa which is made from cacao powder is bitter. Cocoa is pulverized chocolate. The Aztecs are attributed to have concocted adding sugar and milk to make cocoa drinkable, and the world got hooked. Today, many believe chocolate is an aphrodisiac! Roses . . . Chocolates . . . Psychologists usually equate love with our hearts. Poets may have conspired that the heart is the seat of love. Scientist may disagree that it is the brain where all human feelings emanate. Our senses: taste, hearing, sight, smell, and touch, are ruled by whatever connections we had in our neurons, which are located in our brains. Thus, love might be said as a set of neuronic responses? May your neurons fill you with love on this Valentine’s day!